CLIC (or Cat Lovers In Capistrano) is a non-profit organisation run entirely by volunteers, who are all resident in the El Capistrano Village area of the beautiful Andalucian resort of Nerja. As a result of CLIC's efforts, El Capistrano is home to a happy, controlled collection of friendly and appealing cats – a joy to both residents and visitors alike. But we do need your support in order to maintain our care programme! 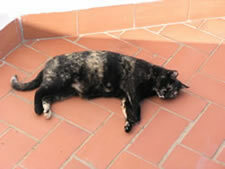 As in most of Spain, if you are a cat lover then you will be well rewarded during your stay in El Capistrano Village. 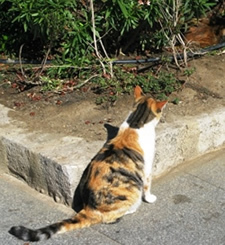 At one time there were several hundred stray and feral cats in Capistrano, but thanks to the indefatigable efforts of the volunteers who make up the organisation known as CLIC (Cat Lovers In Capistrano), their number has now been brought down to a more manageable fifty or so. However this has only been accomplished by means of a strict neutering policy, which, together with further careful veterinary care, and a regular and time-consuming feeding programme, requires an awful lot of money each year. Although the local Community very kindly makes an annual donation, CLIC is an almost 100% voluntarily-funded organisation, and is always in need of more funds. If you would like to contribute then your donations will be gratefully received. The rationale is that, unless some organisation such as CLIC is prepared to invest the time, money and effort to control the cat population, it can rapidly become a nuisance to everybody. In other urbanisations it is a sad and distasteful sight to see hordes of diseased and starving un-neutered cats, whose numbers then simply spiral out of control, necessitating unpleasant and expensive measures to deal with this. In contrast in El Capistrano, the cat population is healthy, happy and controlled in numbers. If you are a cat lover then this will be a welcome sight to you. Even if you don’t like cats (and it’s usually one or the other!) then you must prefer seeing our own contented population to that found elsewhere, as described above. This website has been set up to further explain what El Capistrano is all about, and to introduce you to some of its feline population. We hope that it will be of interest to holiday guests here who are also cat-lovers, but above all we would welcome your financial assistance, however small. 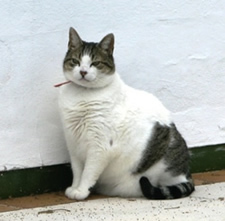 First, though, do take the opportunity to enjoy Capistrano's cats during your stay in Nerja. They will be as pleased to see you as you will be to meet them, especially if you give them some special attention!